Gagosian is pleased to present “Elevator Paintings: Trees” by Albert Oehlen. 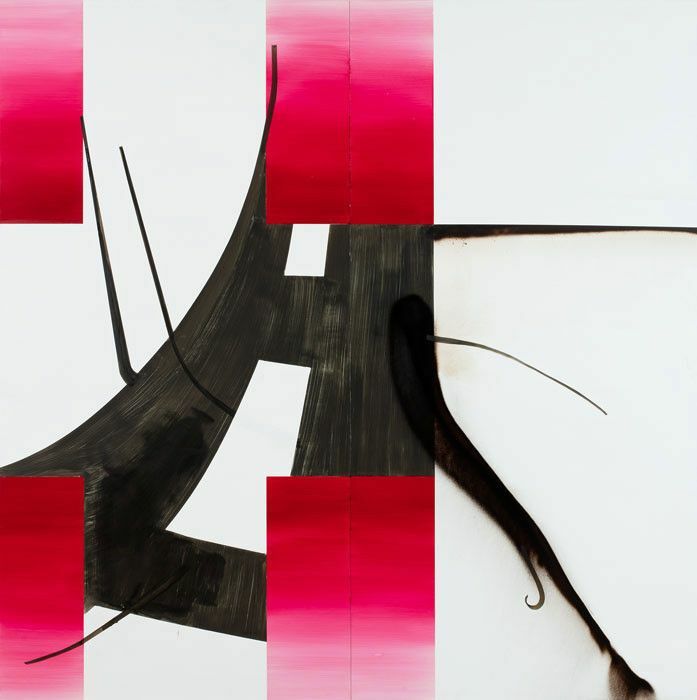 Oehlen’s oeuvre is a testament to the innate freedom of the creative act. Unleashing this freedom through self-imposed constraints, Oehlen sets rules and boundaries in order to test the breaking point of painting itself. Through expressionist brushwork, Surrealist methodology, computer-generated lines, and self-conscious amateurism, he multiplies the potential of visual codes through processes of persistent accretion. Of the two groups of works in “Elevator Paintings: Trees”—both being shown in New York for the first time—the Tree Paintings (Baumbilder) are permutations of an ongoing series that Oehlen began more than thirty years ago. For this iteration, he limited his palette to predominantly black and red. On bright white Dibond, black lines track the hand’s erratic ambulations, while red gradations are contained within geometric figures of a more digital register. The black, mobile lines take on a representative function, as if measuring their own relation to the red, still planes. Using a new technical approach, the Elevator Paintings are all-over polychromatic oil paintings in which Oehlen stages oppositions between clear contours and amorphous blurs. Over areas of clean, solid color, he applies voracious sprays, drips, and strokes in muddy greens and grays, deep reds and flesh tones, further complicating his conflation of erasure and enhancement. A fully illustrated catalogue, Elevator Paintings: Trees, with an essay by Andreas van Dühren will accompany the exhibition.